REDDING, Calif. - Simpson University music professor Dwayne Corbin will be the guest conductor of the North State Symphony during its Christmas Holiday Concert, performed Dec. 13-15 in Chico, Red Bluff and Redding. 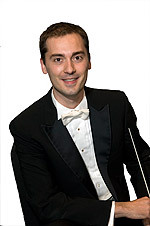 Dr. Corbin is the conductor and music director of The Shasta Symphony Orchestra, a cooperative ensemble between Simpson University and Shasta Community College. In this role, he has led often sold-out traditional orchestral concerts, as well as pops, chamber music, and choral/orchestra events. In the last four years he has commissioned and premiered four new works for orchestra from local and Midwest composers. An award-winning composer, he is also associate professor of instrumental music at Simpson University, principal percussionist in the North State Symphony, and a regular presenter of jazz and classical recitals. Under Dr. Corbin’s direction, the North State Symphony will present “Sacred Scenes,” a combination of familiar Christmas music and selections for small orchestra. The concerts include appearances by tenor Vincent Chambers, the Masterworks Chorale in Red Bluff, and pianist Dr. Natalya Shkoda (Redding and Chico). Concerts are at 7:30 p.m. Dec. 13 in Chico; 7:30 p.m. Dec. 14 at State Theatre in Red Bluff; and 4 p.m. Dec. 15 at Our Lady of Mercy church in Redding. The Chico and Redding performances include a reception. Tickets cost $30 (Chico and Redding) or $25 (Red Bluff). For more information, visit northstatesymphony.org. For more information about Dr. Corbin and Simpson University’s Music Department, visit simpsonu.edu/music.